Alsatian Golf Club offers prime tournament services with planning and details overseen by our Pro Shop staff who bring careful attention to your event. Our trained team of golf professionals will help you execute a finely-run event that will leave you to the leisure of enjoying the outing. The Pro Shop staff will help plan every detail of your event: times, catering, awards ceremonies, scoreboards, advertising, mail-outs, and e-mail confirmations to your group. When your group arrives, you will be met with complete preparation and assistance in guiding your guests and implementing a smooth start and seamless transition from one event to the next. Your group can meet for breakfast and coffee in the Dagger Grill, come in for brunch or full dinner, all prepared by our Dagger Grill staff. Some of our specialties include smoked brisket, our famous hamburgers served on Jalapeno sour dough buns, or chicken fajitas served with homemade rice, pinto beans, and pico de gallo. The Pro Shop staff will assist you to keep consistent play, guide other guests around your tournament, or can clear the course completely, depending upon the size of your group. We also have some unique ideas to make your fundraiser not just the same “run of the mill” golf tournament. We have the Flop Wall, the game featured on the Golf Channel’s “Big Break”, and obstacle course type putting contests. These games can be used as fundraising events by charging the participants to compete in them. The Medina County Texas A&M Aggie Club used these games in their Spring, 2013 tournament and raised an additional $1,200 for their scholarship fund. The Alsatian is committed to making your golf tournament successful and fun. Call the Golf Shop at (830) 931-3100 for details. 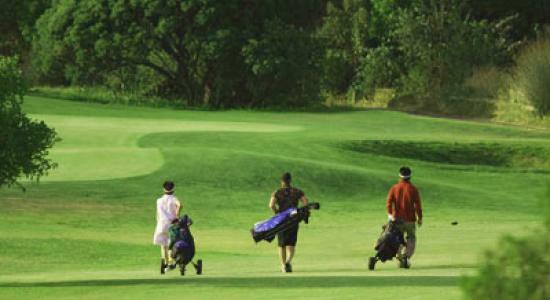 Let the Alsatian Golf Club make your tournament successful and fun!